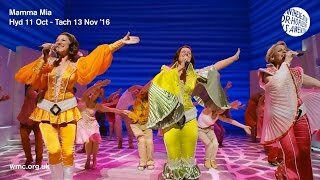 Do not miss this ABBA-Solutely Amazing Musical! Get yourself to the Wales Millennium Centre to witness Mamma Mia! for yourself. You’re guaranteed to have the time of your life and it’s in Cardiff for just one more week!! Mamma Mia is ABBA-solutely amazing – a must see musical for anyone who wants a feel good night at the theatre. Whether you’re a fan of the 2008 movie adaption or prone to belting out a few ABBA tunes in the shower, this is the show for you. Whether you’re a musical fanatic or new to the scene, this show has something for everyone. Its popularity is obvious, having been seen by over 50 million people worldwide and grossing over $2 billion internationally. The movie adaption featuring Meryl Streep, Peter Brosnan, Colin Firth and Amanda Seyfried did wonders for introducing a new audience to the legendary music of ABBA and also encouraged a lot of first time theatre goers. For anyone who is not familiar with the story of Mamma Mia!, it’s a romantic comedy set on a Greek Island paradise. It’s a story about love, family, friendship and identity as Sophie tries to discover who her Dad is before her big white wedding, leaving her mother Donna with the nightmare task of catering for three of her past lovers and Sophie’s potential Dad the day before her daughter’s big day. Throughout the show you’ll find yourself laughing along, tapping your foot and holding yourself back from singing out loud to some of the most well-known ABBA hits. It’s bright, vibrant and a truly feel good show. It really does leave a long lasting smile on your face, and I can guarantee you’ll be singing “Voulez-Vous” for your entire journey home. The production features a strong cast of new talented faces whose energy is infectious from the offset and they bring the characters to life with such enthusiasm and stage presence. Sara Poyzer, who plays Donna, phenomenally brings to life the chaotic mother of the bride in a way that isn’t entirely dissimilar to Meryl Streep’s iconic portrayal in the 2008 movie. She takes to the stage with such impeccable talent, giving emotionally moving performances of “One of Us” and “The Winner Takes it All”. Her charisma really shines through and makes Donna a dynamic character who you really find yourself emotionally investing in and relating to. Her chemistry on stage with co-star, and also real life partner, Richard Standing who plays Sam, is truly endearing – their performance of “SOS” being one of the highlights. It’s a joy to watch them share the stage. Lucy May Barker brings such a fresh faced innocence to the role of Sophie, her wit and charisma makes her a perfect fit for the character. I also think that Tim Walton has been cast perfectly as Harry Bright. His portrayal of an English businessman who revisits the spontaneity of his younger alter ego, Harry Head Banger, is spot on. The characters of Rosie and Tanya really bring the comedic elements of the show to life and make it such an enjoyable show. They have the audience laughing out loud on several occasions, their eccentric personalities are carried out far beyond the script and the on stage dynamic is crucial to the success of the show. Their rendition of “Chiquitita” has you laughing from start to finish. You find yourself routing for Donna and the Dynamos as they ride a suitcase across the stage, twirl grapes around, and drape feather boas over themselves whilst singing Dancing Queen into a hairdryer. And The minute the white lycra appears, and they point their fingers to the sky, you better prepare yourself to experience the iconic “SupperTrooper” like never before. The set and lighting is beautifully designed and executed. Simple, but effective. The set is made up of the taverna, and its walls are revolved throughout the show to show the change of location. It’s used very effectively, particularly in the hen night scene where we see Bill and Sophie leave the party and the walls turn behind them. The show is definitely a must see! I urge you to get to the Wales Millennium Centre to catch this show before it leaves Cardiff on the 13th of November.